The Samsung SMT- i5220 IP handset is a very good reception or executive IP handset. What it does very well is the combination of IP functionality mixed with 24 clearly visible buttons you’d find on a traditional pbx handset. The Samsung SMT- i5220 IP handset is a very good IP handset. What it does very well is the combination of IP functionality mixed with 24 clearly visible buttons you'd find on a traditional pbx handset. For most users this and the SMT-i5210 IP Phone would be the smart choices in a typical office composition. What you lack over the next model up (SMT-i5230) is the 99 programmable buttons versus 24 with the SMT-i5220 IP and the choice of 64 polyphonic ring tones. Plus the i5220 phone doesn't come with a fancy LED screen so you need to use paper labels for your programmed keys. The reality is that this model is easier to use because you can see all 24 keys at a glance whereas you need to scroll 5 at a time for the 99 buttons on the other model. The screen size is the same, the Codec is the same, and all round it is probably better for day to day users. Next to the 24 programmable keys there are busy light indictors that offer 3 different colours to distinguish whether users are busy, free or in a meeting on DND (Do not disturb). This makes day-to-day use a breeze. If you choose to program any of the buttons for functions the LED will then show if the feature is active or not. If for some reason, like a receptionist, you still need to see more than 24 staff/phone lines displayed you can easily attach the optional SMT-i5264 DSS console with an extra 64 buttons. Therefore in total you can have 88 customisable buttons on the handset. Another option for increased staff visibility is the Samsung OfficeServ Operator. This is a PC based application and is more efficient for larger staff numbers or volumes of calls. It allows receptionists to answer, park, transfer and more with the click of a mouse on your PC. You will need two monitors to get the most from the Samsung OfficeServ Operator if your receptionist multitasks. The Samsung SMT-i5220 VoIP phone offers 4 context sensitive soft keys below the screen. This means that it will intelligently display the most logical options for users depending on what they are doing at any given time. If you're accessing voicemail for example, it will present on screen options above the soft keys like delete, save, replay etc. If you're looking for a cheaper model then the SMT-i5210 IP phone is also very good. Here you have 14 buttons instead of 24 but for most users (especially in smaller companies) this is more than adequate. All models offer users the ability to have either a 30 degree or 60 degree viewing option if you prefer a more upright look and feel. If you need to wall mount the phone there is also an optional bracket available for this. There is a jog dial button in the middle SMT-i5220 VoIP handset. This has become par for the course for most modern handsets and it allows users easier and faster access to system functionality, system speed dials, redials and more. On the SMT-i5220 handset you'll also see that Samsung have intelligently broken up call functions to the bottom of the phone and left system functions near the jog dial in the middle. This means that call functions are all together and easily found (mute, volume, keypad etc). It may be easily overlooked but it goes towards the general usability of the SMT-i5220 as well as the other Samsung IP models in this range. Being an IP phone the SMT- i5220 handset comes with the typical IP benefits. Most IP phones are genuinely plug and play to a live Ethernet port. They automatically self detect when logged in and bring all the personalised user settings and extension number with them. As a result IP handsets are also great for hot desking and connecting remote users. Digital phones are different and you have to reprogram the system if you choose to move staff around. The SMT-i5220 has 2 Ethernet ports (both 10/100MB) so you can use one available Ethernet port in the office for both your office phone and your PC. If you operate a Gigabit environment you can also attach the optional SMT-A52GE Gigabit Ethernet Adaptor. 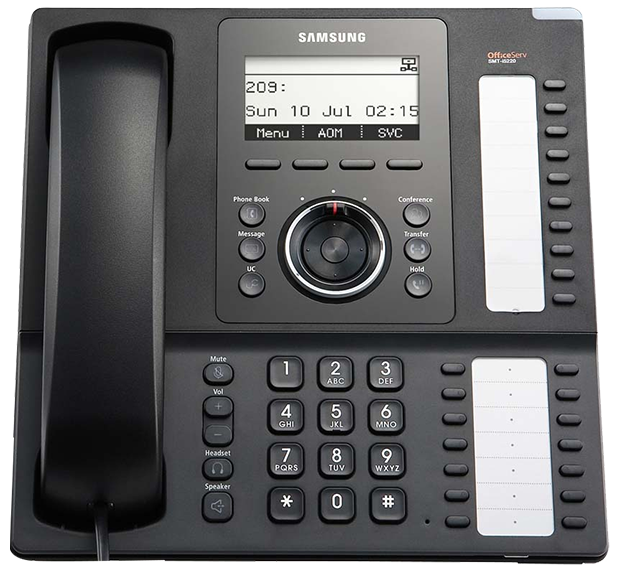 If you're specifically after a larger colour screen for multimedia applications then the Samsung SMT-i5243 is the only choice in the Samsung SMT 5000 IP phone series. Like most smart hybrid systems you can connect any type of Samsung IP, digital, wireless IP or analogue phone to the OfficeServ telephone system. This means that depending on the specific needs of your staff you can also choose from the cheaper Samsung SMT-i3000 IP phone series or the Samsung 5000 phone handset range. If you already have 2 points cabled from previous systems phone handsets are an excellent way to reduce implementation costs without sacrificing user functionality. If you want to check out a phone handset option then look at the DS 5014D phone or the slightly better Samsung DS-5021D phone. For technical specifications of the Samsung SMT-i5220 please refer to the comparison table below showing all models in the SMT-i5000 IP phone series. Looking to learn more about Samsung SMT-i5220 IP Phone Handset?